I'm stepping down from developing Soldat. Soldat needs to move forward in a more rapid pace. I got many chances but didn't deliver big improvements. It is time for someone else to move the game forward. If you think that is you, please contact MM (via forums private message). So are We left with unfinished 1.7.2 and 1.8?, this is so weird. Good luck with your next projects man! On one hand, I am sorry to see you go, because you are a really nice guy and I've had real nice time chatting with you past months. On the other hand, Soldat needs this. You weren't able to make progress (due to legitimate reasons), and hence the torch shall be passed. Long live Soldat indeed. And a sincere best of luck in whatever it is your do next! Now when there's no one left willing to pick up you leave. great fun it has been. What is your fav gamemode? I dont think so, mostly because Soldat is hold tight by bunch of old guys who treat it as their pet. You can probably expect another lazy development because anyone who left here and have skills dont play Soldat anymore/do other things, and people who wanted to help where forced by others to "get lost" because they dont like people who wanted to do some major changes in game. 1. 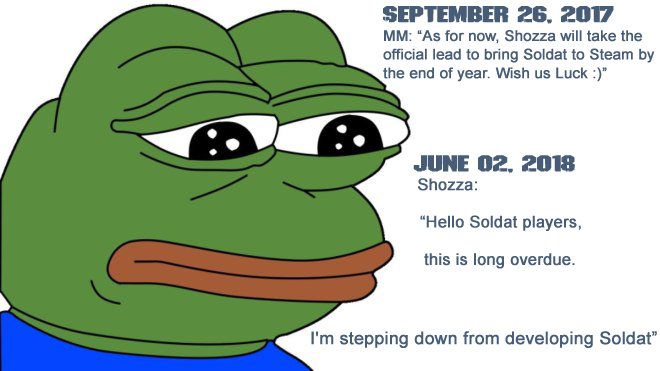 MM will decide to focus on soldat and bring it to mainstream as THD main project. 2. Soldat need proper dev team, especially from "outside", because current team as show us for past 100 years is not capable to do ANYTHING with this game, they rather spend fighting each other over WM than move game to next level. Paid or not, Soldat need not only new players but also new development strategy and team. For now its some crappy weekend project for few blocks who have no idea what they doing. There is no clear and transparent schedule, no clear to-do, no public work/to-do list, no clear and public development discussion, No desire to use community help with smaller task like proper graphic and map work(instead of putting it all on one man shoulder like Monsteri). Soldat have huge potential, it have everything what game need to be played, all what its need to reach new players is better look and GUI, some features like local/global stats and of course PROPER advertising. If MM will start treating Soldat as product, like real game, nothing is stopping Soldat to be played again, even netcode and WM is not issue, because even AAA games have such problems. Hi! My name is Shoozza, welcome to Jackass!